The importance of good mowing practices is often overlooked but has a major influence on turf consuming maintenance practice and it is often done incorrectly. 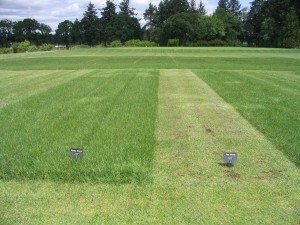 Turf can be mowed frequently, provided no more than one-third of the grass blade is removed in a single mowing. Mow as high as possible. The optimum height for home lawns is 2.5 to 3 inches. Lower mowing produces a shallow root system which cannot absorb water and nutrients making the lawn susceptible to drought stress. Low mowing also encourages broadleaf weed invasion. It is best to mow a lawn when the leaves are dry since dry grass cuts cleanly and clippings distribute more evenly. Instead of mowing on the same day each week, only mow when your grass needs it. This will depend on weather conditions, when you’ve fertilized, and the amount of water that the lawn has received. And remember – keep that mower blade sharp! A dull blade will cause injury to the grass plant and cause stress, increasing the possibility of insect and disease problems. It is not necessary to collect clippings if you have mowed no more than 1/3 of the grass blade. They decompose quickly and add nutrients back to the soil. It’s a built in fertilization program every time you mow! Leaving the clippings on the lawn keeps them out of the landfills…and that’s another environmental benefit. However they cannot be heavy lumps of clippings that will heat up and block the sun from the growing grass.